If you do your own automotive repair at home in a garage – or even in your driveway – it is important to know how to safely store the fluids and cleaners that you get from your local LaCava Brothers auto parts store. Many of these fluids are necessary to keep your vehicles in tip top shape, but they can also be dangerous if they are not handled or stored in the right way. The information provided below is “general” information regarding the class of fluids that you will see at your local Fall River auto parts and services store. For specific details as to the storage, use, and disposal of these fluids, make sure to read each product label carefully. Never assume that just because one brand says one thing that all brands will say the same. If you have any questions about any products you purchased at LaCava auto parts, make sure to give us a call. Our team of friendly and knowledgeable staff can answer your questions and tell you if we have the products in stock. If we sell them but don’t have them in stock, we can order them and let you know when they are available. You might not know this, but all automotive fluids are poisonous. They should never be stored or kept around children or pets. Antifreeze actually “tastes good,” making it even more dangerous to children and pets than other products. Other behaviors that have become popular with kids and teens, including sniffing and huffing, will often involve automotive fluids. It is more important than ever to make sure that these items are properly stored and kept out of reach of minors and pets. Sniffing and huffing these products can be deadly. Automotive fluids are also extremely flammable. In particular, fuels like gasoline. Other fuels, including diesel, ethanol, and methanol, can also be ignited. Corrosivity is another issue that you need to consider with many automotive fluids. Diesel fuel and battery acid can both cause very serious chemical burns and are extremely corrosive. If they come in contact with your eyes, they can cause blindness. It is important always to wear a face shield or use safety glasses when working with these fluids. BONUS TIP: Reactions can also occur when fluids come in contact with other fluids, including violent explosions. 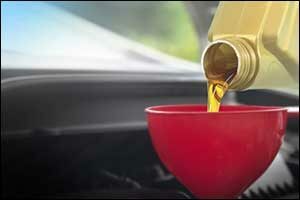 Check containers to ensure they aren’t leaking and never mix different types of automotive fluids. In most situations, and when used according to the manufacturer’s instructions, auto fluids are safe to use. However, there are still things that you can do to make them even safer to use. Many of the tips below are just “good habits” that you can develop as you grow in your knowledge of DIY (do-it-yourself) auto repair and maintenance. Even common fluids, such as windshield wiper fluid, are toxic and dangerous. It is always better to be safe than sorry when it comes to any of these products that you can get at your local auto supply in Fall River. Check fluid levels and fill fluids using a funnel. This will prevent dangerous spills, which can intensify if the engine is hot. Never store items that are leaking, either from the container or the lid. Lock up all chemicals, cleaning fluids, and other automotive fluids in a cabinet that is childproof to prevent access 100 percent. Clean up any spills that occur right away. Even check things like rags and funnels to make sure pets and kids can’t get to them. Only store your chemicals in the original containers that you got from the auto parts store. Do not store in empty food containers, such as old coffee cans, food cans, or jars. Don’t buy in bulk if you aren’t using in bulk. Make a trip to LaCava Auto Parts when you need products to avoid having to store dangerous automotive fluids and supplies at home. Never store chemicals in attached garages or inside the home where they can affect the air quality for your family and pets if a leak occurs. Bring old fuel and used fluids to the proper disposal locations in your hometown. Don’t store them for long periods of time before disposal. If you have fuel-soaked rags, make sure to air them out before throwing them away to prevent a fire from starting, but keep them away from kids and pets during this process. Never dispose of antifreeze or other automotive fluids in the city sewer system or into a septic tank. Recycle these products and dispose of properly. 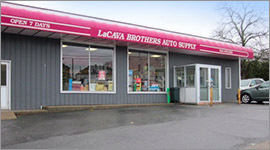 Whether you need to pick up automotive fluids, cleaning supplies, or if you need Fall River auto parts and services for your personal or commercial vehicle, you can get everything you need at your local LaCava Brothers auto parts store. Stop by our location on Bedford Street in Fall River or give us a call at 508-676-1951. We have provided quality products and services to customers in the Southeastern Massachusetts area for over 70 years. You can count on LaCava Brothers Auto Supply for all of your auto parts, products, and services needs.